Who Would Win: 'WoW's Lich King, or 'GoT''s White Walkers? Sorry HBO, the title for most intimidating undead army has already been taken. Everybody loves the undead in media; whether they be frosty White Walkers or just simple, shambling zombies in The Walking Dead. As a whole, the undead are always considered terrifying and dangerous creatures. As single entities, most undead creatures can’t accomplish much, but under smart leadership and organized into a horde? Well, that’s a different story. Typically, these hordes comprise hundreds of thousands of undead in varying shapes and forms, all brought together under the direction of a powerful individual – like the Night King’s army in Game of Thrones. But are the White Walkers the most powerful undead horde in existence? World of Warcraft begs to differ. One of the most powerful forces in fantasy, the White Walkers are ancient creatures who command of a massive army of undead. They are thousands of years old, born from powerful and dangerous magic to protect the Children of the Forest from the First Men. But as time went on they broke free from the Children’s control and lay in waiting, ready to strike against the living when the time was right. Eventually they struck out from the Far North against the people of Westeros – killing all in their path and raising them to fight within their own armies. It took the combined might of everyone in Westeros to push them back and construct the Wall from the show to keep them at bay, which has kept them locked away for now. White Walkers are extremely dangerous in hand to hand combat, with magical powers and weapons related to ice and cold. They’re able to freeze just about anything they touch, have superhuman strength and wield weapons made from ice that shatter conventional weapons on contact. More important however, is their ability to raise the dead as their servants. Known as Wights, they can be raised by the White Walkers at will and are only destroyed by fire or by breaking them apart. There’s no question that the White Walkers and their army of undead are one of the most dangerous threats to Westeros in the world of Game of Thrones, but you can’t help but wonder how they would fair against another undead legion from fantasy storytelling – The Scourge from World of Warcraft. One of the four major undead factions within World of Warcraft, the Scourge is a massive undead empire led by the Lich King. Originally created by the Lich King in service to the Burning Legion, their mission was to spread terror and destruction across [Azeroth](http://wowwiki.wikia.com/wiki/Azeroth_(world) in order to weaken the world for the Burning Legions upcoming invasion. In order to form his army, the Lich King created and unleashed a magical affliction known as the Plague of Undeath across the entire continent of Northrend – which killed nearly every living creature regardless of race and raised them once again as undead under his direct influence. As the leader of the Scourge, the Lich King is a powerful combatant and master of death and decay. He wields the powerful runeblade Frostmourne in battle, which consumes the souls its victims in order to further augment the power of the sword. Frostmourne also has the ability to shatter almost every weapon it comes into contact with, with only one legendary weapon known as the Ashbringer being able to withstand blows from it continuously. Even without the power of his runeblade, the Lich King has a wide variety of frost, blood, unholy and shadowfrost spells at his command which he can cast freely. Not to mention his ability to raise the dead and command them telepathically, augmenting them with his own powers as he sees fit. These augmentations have led to the creation of a vast army of undead supplemented by loyal organizations who specialize in specific crafts. Take the Death Knights for example, who are melee warriors clad in plate armor risen from the dead and augmented with the Lich King’s own abilities. Utilizing their runeblades these knights can call upon the power of unholy magic to raise the dead, frost magic to cut through their enemies, and blood magic to heal themselves while bolstering their own strength. Specialized units like these make up a large portion of his undead army. 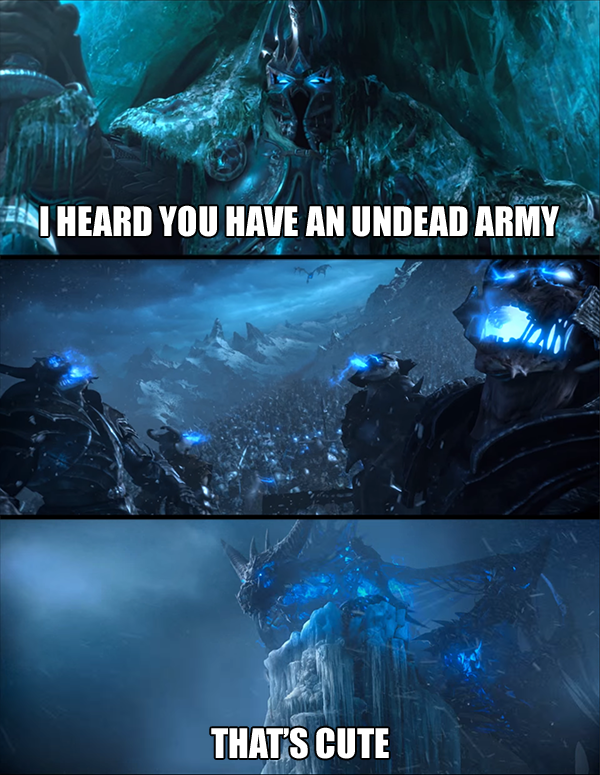 If the undead legions commanded by the Lich King and the White Walkers were to meet on an open battlefield, there’s no doubt that it would yield an epic battle of the ages. But in the end it wouldn’t be much of a contest – The Lich King and his Scourge would dominate the White Walkers and their undead army after they put up a decent fight. In an individual fight, the Lich King and the Night King would be pretty evenly matched, based on what we know. With both having years of combat experienced augmented by supernatural strength, it’s a safe bet to say they’d be evenly match in combat. The interesting thing is that both of their weapons have the power to shatter other weapons and while it would be possible for one to shatter the other, it’s probably fair to assume that Frostmourne would be able to withstand blows from the White Walker’s weapons and vice-versa. The Lich King would have a much larger selection of magical abilities here though; with blood, unholy, shadow and frost at his disposal compared to the single-focused frost abilities of the White Walkers. With their armies in play the battle would be a completely different story – namely due to the variety of units the Lich King has at his disposal. While most of the Lich King’s forces are comprised of the same skeletons and zombies the White Walkers use, he also has specialized legions under his command used to for a wide variety of different roles such as Death Knights, Necromancers, Liches and Frost wyrms. By utilizing the power of the specialized units under his command, the Lich King would be able to easily exploit the weaknesses of the undead controlled by the White Walkers; burning them with frost fire and breaking them into pieces with his legions of undead dragons and knights. Hell – he may even be able to turn them against their masters. Someone tell Jon Snow to send a raven to Azeroth. The Lich King and his Scourge are waiting to destroy the White Walkers while Westeros continues to play with politics.